Everyone is buzzing about the president's birthday! Especially George Washington's servants, who scurry around the kitchen preparing to make this the best celebration ever. Oh, how George Washington loves his cake! And, oh, how he depends on Hercules, his head chef, to make it for him. Hercules, a slave, takes great pride in baking the president's cake. But this year there is one problem--they are out of sugar. This story, told in the voice of Delia, Hercules's young daughter, is based on real events, and underscores the loving exchange between a very determined father and his eager daughter, who are faced with an unspoken, bittersweet reality. No matter how delicious the president's cake turns out to be, Delia and Papa will not taste the sweetness of freedom. 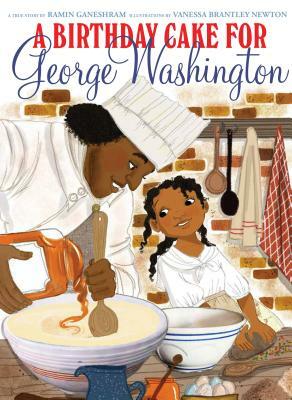 New York Times food writer Ramin Ganeshram and acclaimed illustrator Vanessa Brantley-Newton serve up a slice of history in a picture book narrative that will surely satisfy.